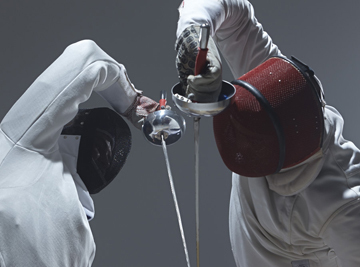 The topic which regularly comes up in fencing discussions: how important is winning? Should one strive to win every fight? Not unless you are taking part in an important tournament. When you train, you should allocate the energy to improving your technique rather than focusing on winning. Most of the fencing technique is acquired during the individual lessons when the coach introduces a new action and makes you practice it, initially in a slow motion, gradually building up the speed and the automatism of the movement. The next stage is to try to use this action during the bouts. Obviously, since you've just started learning this new move, many times you will not execute it perfectly and will lose points as the result. Do not get disheartened at this stage. When acquiring the technique your success is not in winning the fights, but in getting better at performing the newly learned action. If you'll try to avoid losing at any cost, you'll find yourself repeating the same old limited number of actions making your fencing very predictable and easy to outmanoeuvre. You should mentally earmark some (or even most) of your fights as training bouts dedicated to perfecting parts of your technical repertoire. Do not try the same new move again and again - it will soon become too obvious to your opponent. Instead make sure that you use the new action 3-5 times in a 10 point bout. Weave it in along your other actions and you will see that gradually it'll become more and more effective, bringing you points rather than losing them.